I like to think that I get more organized with the birth of each child. In reality, I think it almost becomes necessity. And that must be why my grandmother, with 15 children, seemed to have an efficient method or system for just about everything. I learned so much from her. I’ve been feeling the urge “to crack the whip” (as my mother would say) around here the past few weeks. I’m at the point where my body isn’t able to do all that my mind knows needs to be accomplished. I can’t get it all done by myself. And my children are definitely eager to help when I present it well. One of our usual “nagging sessions” comes in the morning and the evening as I dole out the daily chores. 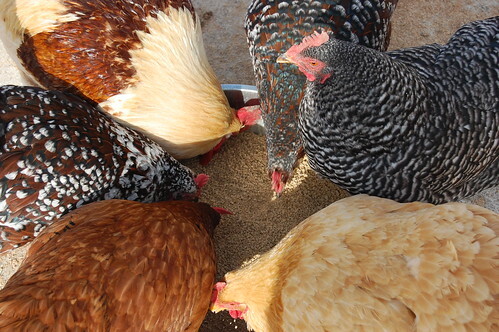 Who’s going to feed the chickens? Who did it yesterday? Who feels like they always have to let out the chickens? I’m finding that this simple visual system is saving me boatloads of nagging and the jobs are getting done much more smoothly. Well, I don’t have kids, but I do have a big kid husband. I always felt like one of a few things happened around our house: 1. I was the only one cleaning because he thinks “straightening up” is cleaning (God help me.) 2. I would neglect cleaning for working and nothing ever got done or 3. I would pitch the biggest fit known to man, out of sheer frustration, and he’d start cleaning and end up the only one — because I was just happy things were clean. Terrible, vicious cycle! Btw. I love that your kids love lists. They are after my own heart, I swear! I usually beg, borrow, and plead and then yell like a lunatic to get the job done. Three teenagers don’t cooperate. I have found that the threat of having to wash all the dirty underwear by hand gets the youngest moving and just the other day the threat of not letting the oldest get in drive time worked like a charm. When my four were all little (like yours) my mother asked them to clean up and they told her that they don’t have to until Mommy starts screaming. :O) and if this weekend was any example – they’ve trained me well. the underwear threat made me laugh. oh gosh – I’ve been feeling the same thing and somehow, the message is NOT getting through. Especially not to my husband, who made a big breakfast yesterday because *he* wanted it, complained that no one was helping, and then left me a massive mess in the kitchen to clean up so he could go watch the hockey game. And did I mention that I’m sick? Ugh. Lucky for him, I felt too crappy to even attempt to talk to him about it. Today, being Monday, and the first of the month, we are beginning a whole new routine for the kids and me – one that we definitely need, with that baby coming sometime this month. Because let me tell you, if we keep going like we are, it will be intolerable around here. 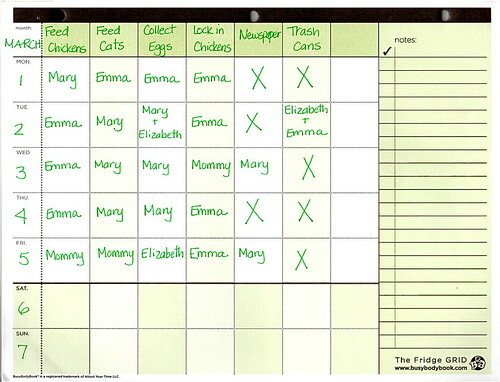 Since you asked – the kids swap weeks taking care of the chickens and feeding the dogs. Most mornings, I let the chickens out because I’m up first, and I like going out there and giving them their morning food. One kid does dog poop, and the other does cat poop. The elder one is taking on more responsibility and will have an increase in his allowance. He’s taking on putting away dishes, and doing some of the dishes, he is in charge of the laundry rotation up to the folding (which I do), and he does trash and recycling. The younger one will help some with the dishes and sweep the floors. They are each responsible for the cleaning of one bathroom and for keeping their spaces neat. We’re trying the 20 minute sweep before dinner – putting away everything that accumulated during the day, but I’m still fighting the “oh, I’m soooo tired” routine when we do that. I’m wishing us both lots of luck! I get the “no thank you”, too, as if it were a choice – I guess that’s what you get when you ask nicely! When we started school last fall (the first year that both boys needed to get out of the house every week day), I sat down with them and made checklists for before school, after school, and before bed, to keep us all organized. It worked wonders – they still check the lists frequently and now when they ask if they can play they always add, “After my responsibilities” to the question. In the mornings when someone’s dawdling I can just say, “Go check your list” and move on to get ready myself. I’m glad your chores list seems successful – I think it’s the way to go! I’ve always said they are too little to do much of anything but the 4 year old is definitely capable. I think I need some way of writing it out like you so I don’t have to nag. That would probably work well for the husband too. We recently spent some time with my brother and his family. They have two children and on their message boards (which were right by the entry way so each girl could see what needs to be done) was a list for each to see. I loved the lists so much that I copied them down and use them with my oldest daughter. My younger one is still to little to understand but someday she will! 1. Brush my teeth2. Brush my hair3. Make my bed4. Feed Greta5. Make sure Poppy has water6. Eat a healthy breakfast7. Make sure I have everything I need for school8. Put my dishes and cup in the sink, rinse them off9. Wipe up the table10. Decide that I will have a GREAT day today! i’ve been working on this for a few months but we need a chart! right now the girls are responsible for one bathroom each (it’s amazing how they actually like to clean them), their bedroom, clearing the table and helping with dishes, taking the recycling out (one does paper, the other cans and bottles), matching socks (i hate that), and putting their laundry away. areas that need help are keeping track of their stuff and putting it back where it goes as well as keeping the playroom up to snuff. i think they could vacuum and sweep if i’d let them. i’ll probably add those and some yard work once school starts to wind down. “after my responsibilties” that must be music to your ears! We’ve had charts off and on. I think it’s important to include Mom and Dad on the chart as it helps the kids recognize that we’re all in this together. Our children (age 11 & 13) do all the setting & clearing of the table and all the dishes, pots/pans, cleaning of kitchen after dinner. We worked up to it with setting/clearing, then dishes in dishwasher, now it all gets done. My husband and I get up from dinner and go in the living room for a visit. When we had a chart, Mom & Dad alternated cooking/dishes, kids alternated setting/clearing. Now we cook, they clean. Our Saturday chart list included vacuuming, laundry for me. Husband garbage, lawn. My younger daughter had collecting trash, older daughter had their bathroom. Of course I did more, but the point was that we were all on the list. This is wonderful. My four year old and two year old are starting simple chores now and it would be so good to have something tangible that they can look at! i moved all our dishes to a low shelf so the kids can reach and in turn help with kitchen cleanup. (seems like all i do is clean that kitchen!) they also do chores like wiping sinks and emptying trash and it really helps that my husband has learned to recognize the glazed over look i get when things start to get untidy or behind. he is quick to start barking orders and whipping things back into shape so i don’t have to be the one barking all the time! We’re just getting started on the chores. My boy is a busy 3 1/2 year old (aren’t they all?). Since he can’t read, and in order to engage him a little easier, our chart has pictures of him helping Mommy (making his bed, taking his dishes to the counter, feeding the dogs…). When he helps with these things, he gets to put a sticker on the chart. At the end of the week we count up the stickers and he gets a coin for each sticker that we divide between Sharing, Saving and Spending jars. He doesn’t really care about the money, but he likes to count. I started that so early so we could start talking about spending, money, etc… Much to my dismay (and with some relatives’ influence) my kid is already wanting to be quite a little consumer. He is certain that a trip to Target means more toys for him. Uggh. I like Amy’s #10. I think I’ll add that. I’m enjoying your blog – thanks! I’ve got 2 weeks to go before delivery and am SO feeling your pain. Unfortunately, my one shadow is only 3 and limited in what she can do alone. What I wouldn’t give for her to head out at dusk and flip the chickens’ door shut! I call them “Family Participations” instead of chores. They are things we do as a family to participate in the taking care of our home. You get one participation for every year old you are, up to ten. (The youngest does things like put dirty clothes in the basket) It makes for a funny birthday tradition, picking out a new participation. Mom and Dad are on the list too, so the kids can see some of the things we do: laundry, plan meals, grocery shop, pay bills, etc. Your post and all of the comments have inspired me to actually follow through with all the plans in my head. My three are 6, 4 and 3. We have our morning routine down pretty well and they do like helping make meals, serve/set, clear, etc. However, I’d like to make it a bit more clear as to what their responsibilities are as well as working on tidying their rooms each day. If I’m totally honest, I need to crack the whip on myself. This year, with two in school most mornings, I’ve gotten out of my routines. A new month seems like a great place to start. I know what I’m doing tonight after bedtime. Good for you for putting things in place to make life easier and smoother for your whole family.My children are just a few years older, and I now give them monthly chores. For a full month they are responsible for a certain “zone” in our home. It’s working out well. gina, that’s how i feel about the kitchen sometimes…i get it clean just in time to get in there again and make another mess! I guess it is the heart of our home! Family participations… I love that! I need inspiration in this area. I figure that since there’s just the two of us, and only I can do the heavy work, I’ll just work on the training of minor chores for the moment. DD is getting better stacking the dishwasher and doing the drying up. I’m trying to get her to mop the floor dry after washing the floor. Vacuum cleaning is a hit and miss affair, and the cats have their own opinions about it LOL! But so far, I haven’t written a list or chart.